Washington, D.C. – May 18, 2016 – Reading Is Fundamental (RIF), the nation’s largest children’s literacy organization, launched its summer reading campaign aimed at inspiring children and families to read and have fun together between school years. Research shows that all children are at risk of losing some of the learning they obtained during the school year over the summer. For students from economically-disadvantaged communities, as many as 80 percent are at risk of academically falling behind. RIF’s family-friendly booklists and activities are fun and engaging ways to maintain reading ability throughout the summer. In addition, RIF continues its 50th anniversary activities through its partnership with ustyme to give away a billion free e-books to anyone with access to a computer, tablet or mobile phone. Whether families are planning a staycation at home or a vacation on the go, reading and sharing stories together is easier than ever. For a full list of recommended books for children and downloadable summer-themed activities for summer, visit RIF’s website for more information: www.rif.org/summer. Reading Is Fundamental (RIF) transforms lives through the power of books. By providing children in need with access to books of their choosing, RIF empowers young minds to embrace the world of reading and develop a love of learning. 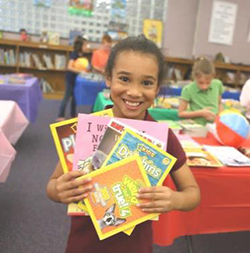 As the nation’s largest children’s literacy organization, RIF has provided more than 412 million books to 40 million RIF kids over 50 years, inspiring generations to read, learn and grow. Sign up for our newsletter and follow us on Twitter to learn more.